First of all I apologize to all the bloggers whom I follow, as I haven't been able to visit any blogs in past 1 week, so please don't think I am ignoring anyone. I also would like to apologize my readers as I haven't been posting as often as I used to in last few weeks due to few reasons. One you already know from my last post that my friend's husband was sick and we wanted to help them in any way we could. Thanks to all your wishes, doctors finally doctors diagnosed that he had Collitis (so, the good part is not the diagnosis, but the fact that they figured out finally what was causing all the pain in his stomach), so now, he got discharged as of last evening from the hospital and is on this path of successful recovery. Second reason was that since last Saturday my older one Aryan got cold and then since Tuesday evening, my little one (who turned one yesterday) had his very first cold and due to which a light grade fever. Older one is thankfully a lot better and little one will take may be one more day to get little better. Yesterday was my little one - Atharv's first birthday. We did not do anything much due to his sickness. He, being himself was of course acting all normal, just running nose and light fever, but was refusing anything to eat or drink, so I just made some traditional Rice Pudding (which thankfully he did eat a few spoonfuls as he loves it). We had baked a small pound cake the previous evening (cake mix), so we cut that. Wanted to go to temple, but then unfortunately, the temple that was the closest to us was closed and we didn't want to take the sick baby too far. I didn't want to make something lavish in the evening as kids were refusing to eat everything anyways. So, finally, while I went to buy something, N ordered pizza and we enjoyed that with the cake for dinner. Anyways, that was kind of a gist of my last few days. Now, coming to today's recipe, I had made it on a small get-together on Saturday. I love chana dal that is made in East India reception parties (Specially in my hometown) to go along with pulav and pooris. So, here is kind of my twist on it as I like to have tadka (tempering) on any dal. Take a heavy bottomed cooker. Cooker is best as it takes a while to cook chana dal. Take oil in it and let it be hot. Add all under "Whole Garam Masala" to it and fry till nice aroma comes. Add drained dal to it along with dry masalas and stir fry just for 2 min. Add grated coconut and mix for another min. Add about 5 cups of water and close the lid and cook for about 20 min. or till dal is well cooked (not mushy, but just well cooked). Take it out in a serving bowl. Once the dal is cooked, let's prepare the tempering. Take a non-stick pan and add ghee to it. Once the ghee is hot, add both the seeds and dry red chili pieces from the "For Tempering" section. Once the seeds start spluttering, add ginger and garlic to it and fry fry for about a min, do not let garlic burn. Add finely chopped onion to it and fry till onions are translucent. Add chopped tomato and fry for 2-3 min. don't let your tomatoes turn mushy. Serve it hot with either any kind of pulao or nice warm pooris. I am sending this to Susan's MLLA # 27. That's all for now, take care till post. Happy B'day first to yr son!! Such a cute age! As I'm typing this my 21 month old is trying to climb over me! B'day wishes to little Atharv..may God bless him! This dal is my all time favorite..i make it almost the same way..except the coconut..must have given a nice nutty flavor..might just try it! A big happy birthday to your little one!! Hope he gets well soon..
Never tasted a tadka dal before..Looks great!! hope everything is fine now at ur end..good to see u back..wishing atharv a belated happy bday..god bless him ! nice and cute name..btw dal looks yummy ! Belated first birthday to Atharv!I'm sure he is gonna bounce very soon! Loved your dal! Glad to know that your kids are doing better now ! Belated birthday wishes to Atharv. Hey Priya.. Happy Birthday to Atharv! Such a nice name! Hope your family and your friend's family all get better. Best wishes! Good to know ur hubby is doing well. Thanks for the dal recipe, will surely try this out. I do make a dal (from a Marwari friend) with bay leaves, cloves etc. This sounds delish with channa dal.. Happy B'day to your son..love tadka daal..best with rice! glad to cee u bck,,. Belated birthday wishes to Atharv, hope u guys get well soon, tempered dal looks fabulous and comforting.. Thank god ur friend's hubby is getting recovered ...i am happy for that ...my belated b'day wishes to ur little one ...god bless him ..
Belated wishes to your son. Such a comfort dal looks all homey. Belated bday wishes to your little cutie.. Happy wishes to your little guy! This virus is going around - so just keep them hydrated - helps always. Channa daal looks so comforting. I would like a hot steaming cup of this for lunch today! B'Day wishes to Atharv ! Hope he will recover from cold soon . Channa dal is so inviting,can have it anytime with roti n rice . priya..i make this tempered dal with almost every dal b it whole massor/split ones even toordal,urad dal and moongdal...add lots of garlic and green chillies in tadka....my type of dal priya...looks tempting and mouthwatering..
Looks very comforting and perfect with rice or roti Priya. Happy bday to ur lil one! !Wonderful space here..Now ur happy follower!! Belated b'day wishes to Athrav and wish for his speedy recovery. When we adult have fever it is still manageable but a child with fever can be very challenging . specially when it comes to feed them. I can understand what you are going through Priya. 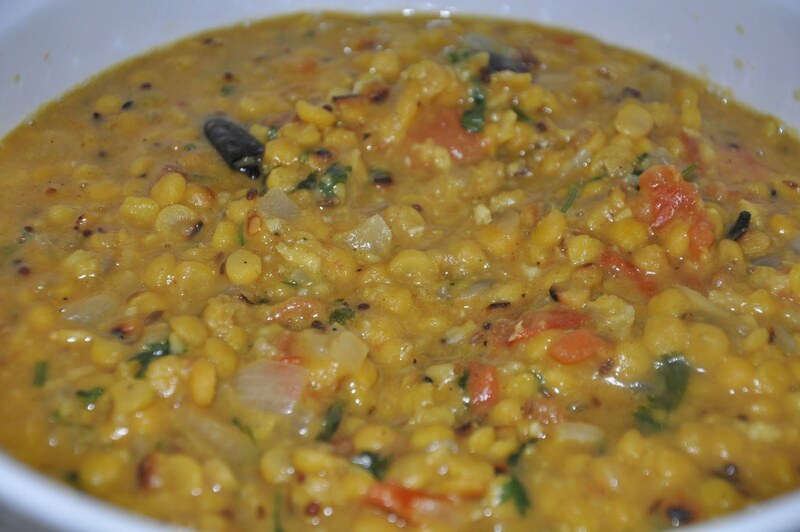 I also make this dal in the same manner:-) It looks fab!! Belated b'day wishes to your lil one Priya :).Hope the kids are ok now.That dal looks so divine.Would love to have it with Pulao. I love this dhal it looks tasty and delicious. CSN Giveaway @ Lav's Blog, please do check !! !